A major global brewer was installing a new packaging line at one of their breweries which was dedicated to a new proprietary specialty package associated with a major marketing initiative. Due to the demands of the proprietary packaging, technologies and equipment which were new to the customer were to be incorporated into the system. It was paramount to design the production line to maximize flexibility since quick changeovers were required to accommodate a wide variety of products and container types, as well as to provide scalability for future expansion. The client had a tight timeframe for the project’s completion based on high demand of the new package. 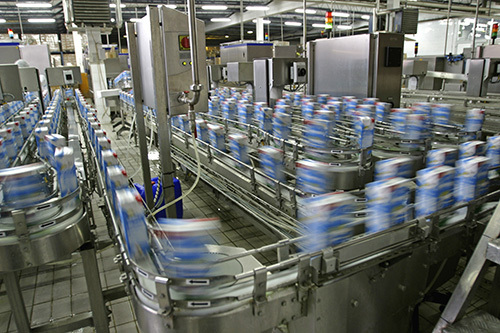 McEnery Automation engineers approached the project as an opportunity to develop a control system that was not only flexible enough to meet the requirements of that packaging line, but also could be utilized as a framework and standard to be used on all packaging lines in the facility. The new design consisted of Rockwell Automation ControlLogix programmable automation controllers (PACs), with Rockwell FactoryTalk View ME applications running on PanelView Plus terminals and a FactoryTalkView SE application running a redundant server pair for their main line control. The system utilized Rockwell’s FactoryTalk Transaction Manager to interface with an Oracle database. Our engineers were responsible for the specifications of electrical components, field devices, motor control centers, control panels, and PLC hardware, as well as development of multiple PLC programs, and development of the line HMI application. We also worked closely with each of the OEM equipment suppliers to integrate their control systems into the site-wide architecture. On-site services included construction supervision, operator and maintenance training, electrical checkout and startup support. The project was commissioned within the client’s timeframe and the packaging line quickly achieved its rated speeds and changeover times. More importantly, because McEnery Automation worked with the customer’s personnel as a team, implementing their ideas and utilizing their experience, the end result was a system that was not only efficient and flexible, but also easily maintainable due to the customer’s sense of ownership.